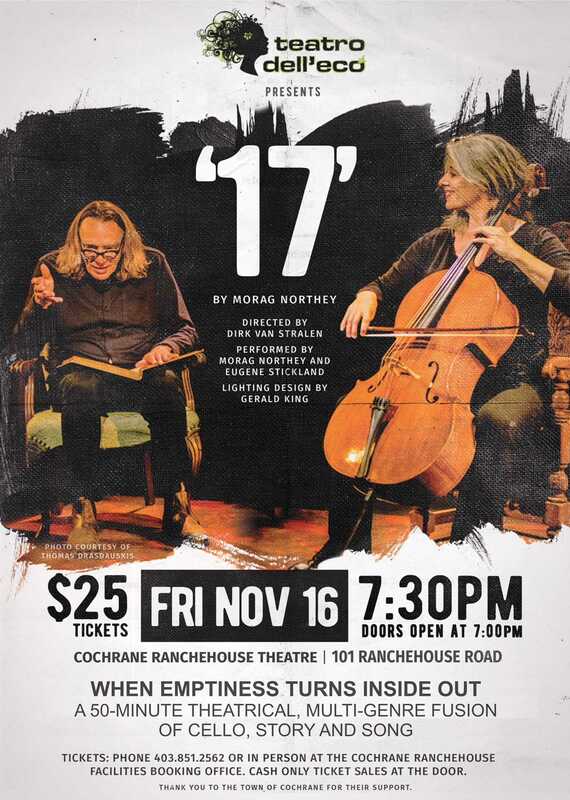 Teatro dell’Eco is thrilled to present Morag Northey and Eugene Stickland in ‘17’ – When Emptiness Turns Inside Out, on Friday, November 16, 2018 at 7:30pm at the Cochrane RancheHouse Theatre. ‘17’ is a 50-minute theatrical, multi-genre fusion of poetry, prose, cello, voice, storytelling, composition and improvisation that takes its audience on one whale of a ride through Morag Northey’s journey as a woman, artist, mother and indomitable spirit. So what exactly is this piece entitled 17? Is it theatre? Is it music? Is it performance art? Is it a text-based musical recital? Yes it is, and no it’s not. It’s all of these, and more. At its heart, it is the story of Morag’s life journey told through minimal vocal narration and a virtuosic cello performance. One thing is certain: the honesty of Morag’s story and the force of her vocal and cello performance has profoundly touched and moved audiences. It’s a night in the theatre quite unlike anything you have ever seen – or heard – before.